Easy Egg Roll in a Bowl is a one-dish meal that’s made in less than 30 minutes and is chock full of all.the.veggies! It’s healthy, it’s easy and it’s oh so delicious! I’m all about easy meals that can be made and on the table in less than 30 minutes. Easy Egg Roll in a Bowl is the perfect recipe for when time is not in your favor and you need something quick. What I love most about this recipe is that it’s not only healthy and delicious but that it reheats ever so nicely. It’s the perfect recipe to include in your weekend meal prep because it makes for a satisfying, veggie-filled lunch in the days following. Bring on the veggies! Broccoli Cole Slaw is an easy solution for boosting your intake of veggies. Sautéing and adding to scrambled eggs. This is my new go-to breakfast! Making our Creamy Broccoli Slaw with Kale. Sautéing in coconut oil or ghee and serving it as a simple side dish. Here’s a 60-second video to show you just how easy it is to make Egg Roll in a Bowl! Comfort food with a healthy twist. The best! In addition to sharing veggie-filled recipes, we’re also all about comfort foods turned healthy and we know you are, too! 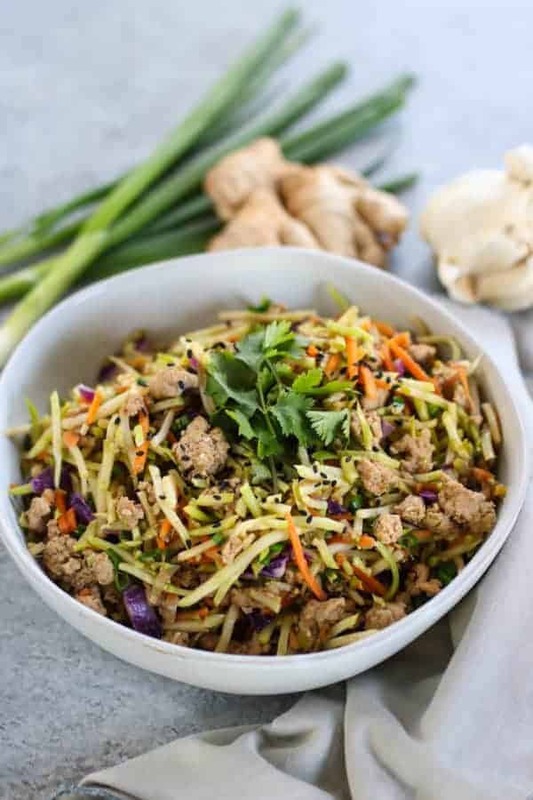 Egg Roll in a Bowl has all of the fried egg roll flavors we love but it’s made with much less sodium, a considerable amount of veggies and no frying needed. Traditionally, egg rolls are made with ground pork, but we lightened this recipe up and used ground chicken (or turkey) instead. However, if you wish, feel free to use ground pork to really get that traditional egg roll experience. Coconut aminos instead of soy sauce. As you saw in the video, one of the ingredients this recipe calls for is coconut aminos. If you have yet to try coconut aminos as a substitute for soy sauce, we recommend that you do. It’s a staple in both of our kitchens and an ingredient we use often. It’s an easy way to greatly reduce sodium, it’s Whole30-friendly, it’s flavorful (doesn’t taste anything like coconut) and it’s made with incredibly clean ingredients (coconut sap and sea salt). Two of our favorite brands are Coconut Secret and Big Tree Farms. 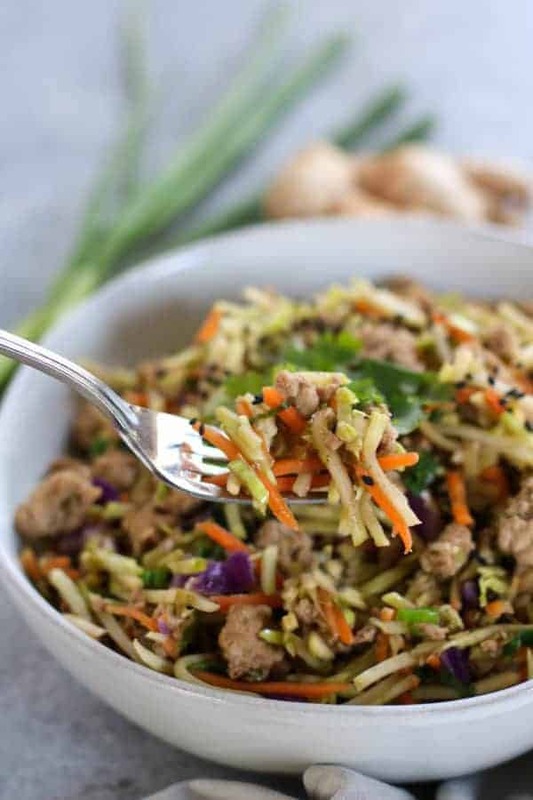 Are you ready to dig in’ and give this Easy Egg Roll in a Bowl a try?! I have a feeling you’ll be making this recipe again and again! 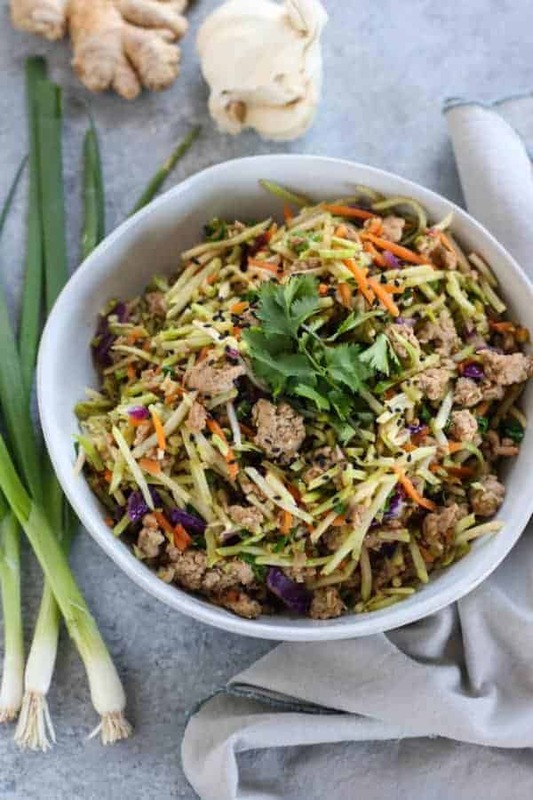 Easy Egg Roll in a Bowl is a one-dish recipe that’s made in less than 30 minutes and is chock full of all.the.veggies! It’s Whole30 friendly, dairy-free, grain-free and paleo. In a bowl, combine coconut aminos, sesame oil, rice vinegar and Chinese 5-spice powder. Whisk to combine then set aside. Place a large skillet over medium heat. When pan is hot add the oil and white/light green parts of onions only. Stir fry for 3-4 minutes or until onions start to soften. Add garlic and ginger and stir fry an additional 1 minute. Add ground chicken (or turkey). Use a spoon or spatula to break meat up into small pieces. Continue cooking 7-8 minutes, stirring occasionally, until meat is cooked through and no longer pink. Increase heat to medium-high. Add broccoli cole slaw and sauce (from step 1). 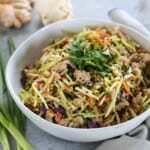 Stir fry 6-7 minutes or until slaw is crisp tender or to your liking. Stir in reserved sliced green onion tops. Remove from heat and garnish with sesame seeds and/or cilantro. Serve with additional coconut aminos or hot sauce, if desired. 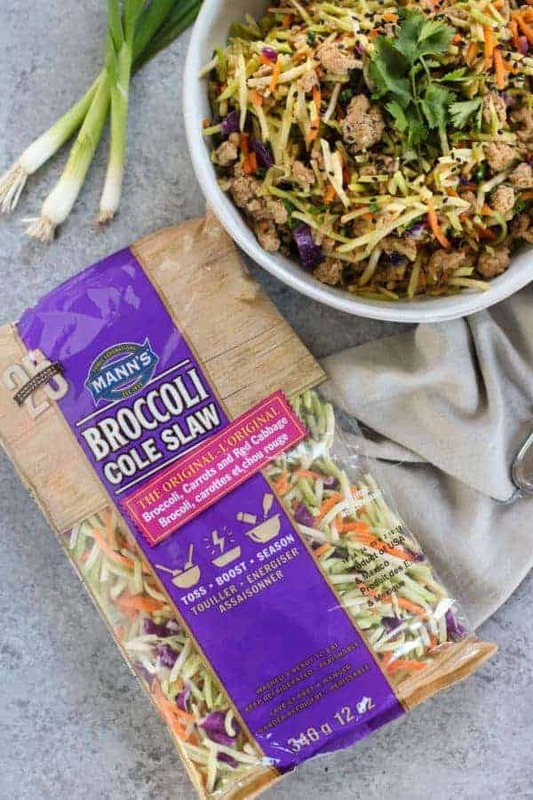 Comment below and let us know your favorite ways to use Broccoli Cole Slaw? 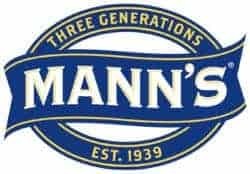 This post was made possible by our friends at Mann’s. Though we received compensation for this post, the opinions expressed here are – as always -100% our own. Thank you for supporting the great companies we work with thereby allowing us to continue creating great recipes and content for you. This looks delicious, but I’m just going to use regular olive oil and low-sodium soy sauce instead of “coconut aminos” or coconut oil. These trends are getting ridiculous. We opted for coconut oil for it’s slightly sweet flavor since there is no sugar added to the sauce. As for the coconut aminos, that’s to keep the recipe Whole30-compliant (as soy is not allowed). Either tamari or soy sauce will work just as well if you don’t need the recipe to be Whole30. Happy cooking! I just finished eating this awesome dish. Love the “snap” of the fresh ginger, and I’ll confess I put more than a sprig of cilantro in it. Never thought of using a slaw this way. I used a chicken breast cut up in small cubes, as I didn’t have the ground chicken. I can see making this with salmon also. Thank you, this is a keeper! Glad to hear you loved it! It’s become one of my go-to recipes lately because it’s so easy and my 6 year old can’t get enough of it either. I don’t see where you add the sauce made in the first step. This dish sounds yummy. However, I noticed the Chinese 5 spice has fennel in it and I’m not a big fan. (Ok I really dislike fennel😒) Is there another spice you could recommend for this dish as I haven’t prepared it yet but I love egg rolls! You could try using a pinch of each of the other spices found in 5 Spice (cinnamon, ground anise, black pepper and cloves) and leave out the fennel. Or just leave out the spices all together and add more fresh ginger, garlic and toasted sesame oil. I love this recipe! It even became a favorite with my 8th graders this year as we discussed what we had for lunch! After I asked them what they had for lunch, they would joke, ” We know what you ate…Egg Roll in a Bowl!” Several of their parents make the recipe, too! It was so fun. Anyway, I can’t find Mann’s Slaw in Kansas City. Just thought I’d let you know! We love this! Seriously, makes us smile! 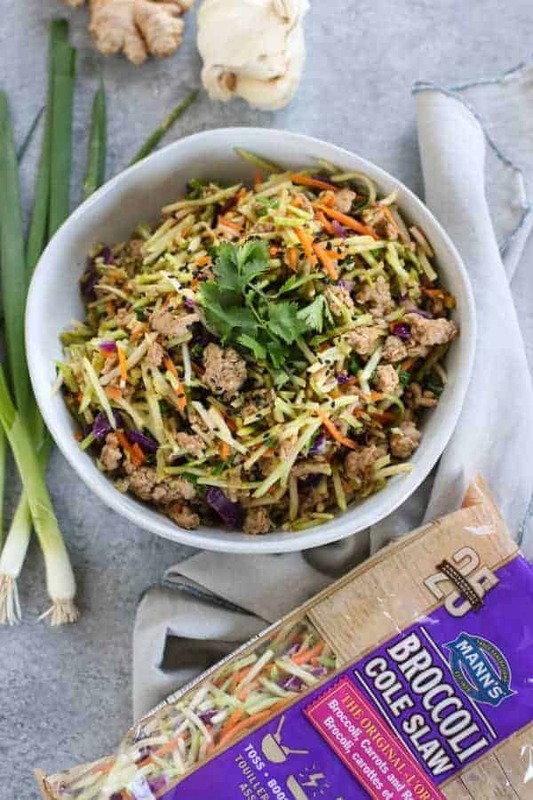 🙂 You can use any broccoli slaw that you can find in stores near you. Taylor Farms, Green Giant, etc. If the slaw doesn’t include red cabbage, I like to add that as well! I absolutely loved this recipe. I’m GF and try to eat healthy as much as possible. Clean, simple flavors. I opted to grate my own cabbage and carrots rather than use the pre-made slaw, but that’s because we have carrots in the backyard! I also opted to use water chestnuts just to give it a little texture and crunch. We’re so glad you loved this recipe. I love the idea of adding water chestnuts for crunch and you can NEVER go wrong with homegrown veggies. I made this last night. So easy and yummy. I could definitely eat it every night. It will be going into the rotation. Is the avocado oil for step 2? The ingredients list states avocado oil but I don’t see it in any of the steps. Yes, that’s correct. I’ve updated the recipe accordingly. Thanks! Very tasty! I made the recipe as presented (I always do that on my first run). I added the sauce when I added the slaw. I had fresh ginger and I added garlic chili paste. I love coconut aminos and the 5 spice really makes it!! Awesome! This is one of my most favorite recipes on the blog. I make it all the time! Glad you like it too and I love the sounds of adding garlic chili paste! My entire family really loves this meal! Thank you so much!! Yessss!! Thanks for sharing, Kristy. We’re so glad you guys love this recipe. I added a little honey and red pepper flakes and it was amazing! Love it! Great recipe with the sauce proportions being perfectly balanced. Realized I only bought one broccoli slaw so added broccoli and edamame from the freezer. Also made a slurry with corn starch to thicken the sauce. Perfect! Nice job improvising with what you had on hand! AND love the idea of thickening the sauce. Just made this for a healthy lunch. So delicious! I used veggie crumbles instead of the ground poultry so my vegetarian daughter would eat it. Had a hard time with my portion control! Love this! And I agree, it’s hard to stop eating this dish -thankfully it’s packed with so many veggies. SO FLAVORFUL! Thanks for another awesome recipe! Y’all are making my whole30 a breeze! So easy and really delicious! I added a bit of cabbage too and it was great. The bagged chopped salad kits (just the veggies) would be a great sub in a pinch too. This will be in my rotation long after whole30. Awesome! Glad you found a winner! Making this for the second time. So flavorful and tasty! I made this last night for my breakfast for the week. Very easy and tasty! It kept and reheated well. I might add mushrooms and water chestnuts next time just for the heck of it, it doesn’t necessarily need anything else.